Very famous word by Doyle Brunson say that you have only done one tenth of your job if you have figured out what you want to do. However, majority of the work is still pending as you still don’t know how you will achieve it. This is very confusing for some but enlightening for others. Let’s look at some of the Poker hands to elaborate upon this. Suppose you feel that the opposite party in the game is playing on Ace high and you are playing on Jack high. The pot already has 8 bets which are of considerable value. The chances of winning this bet by would be greatly enhanced if you are able to bluff through. Now it is just a probability that you will win it at times only. There is no guarantee that you will win it all the times or you will never win it. The step that you have taken to increase your chances of winning is only the ‘what’ part of the game, which means you have decided what you need to do. However, majority action is still pending and you need to decide how you will do it otherwise there will be no output. As discussed in my previous writings, the expertise of sailing through smoothly with your bluff is what I call action. This action is much more important than coming to the decision of choosing to bluff. Let’s understand this with a better example. Suppose player 1 wins 75% of the times when she bluffs and player 2 wins only 15% of the times. So, in a hand of $10/20 she will win $14,500 because she wins 75 times hence earns $200 that many times while she loses $ 20 only 25 times. On similar calculations, player 2 wins only $1300 because he loses $20, 85 times and wins only 25 times the $200. Hence, player 1 is definitely better as he knows how to get through what he has decided to do much better than player2. Hence we can see that though both the players do the same action in a particular situation, one fare better than the other. Hence it is the expertise of how things are done that matters. This example is not the bible in itself. It is just a mathematical representation of how skillful maneuvering of an action is more important than deciding the action. 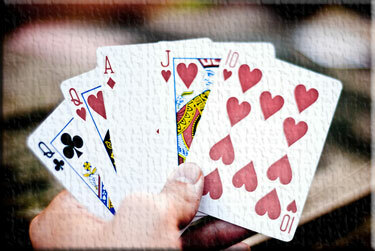 Poker is also a game of math, though most people do not realize this. Though player 2’s choice of bluffing was perfectly right for the situation, he still managed to win less than player 1. He might be basking in the glory of the wins but his pocket is short by a couple of dollars as compared to player 1. So, he has just learn the basic step of choosing the action but still not yet mastered the art of how to achieve the goal. This is what differentiates an expert poker player from others. He knows the maths of performing his whys in such a way that he wins all bets. And this is what poker is all about – sailing through smoothly with your bluffs and saving or winning a bet or stealing the pot. Another interesting situation in Poker which brings out the importance of ‘how’ over what is that suppose you are playing a deal and you find that your hand is really good. You are the last player and you know you are in an advantageous position and will obviously bet. So, it’s rather clear ‘what’ you need to do. However, the way (how) you bet will make all the difference in getting you extra bets from others. If you show too much excitement and jump to play the bet it would definitely intimidate the others who might just pack up. Having the knack of controlling your emotion and deceiving others at this juncture will help you win more bets rather than feeling proud of deciding to bet. Hence, it is very important in life, as in poker, to decide upon a right direction or activity. This chalks out your future and you don't have to spend time readling piles of gaming information. Nevertheless, it is equally important to ensure how you will go about achieving it and to know why you want to do it in the first place.